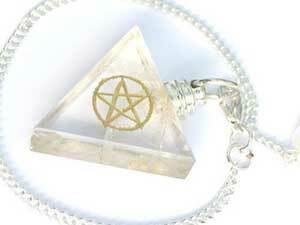 The Crystal Pendulum is Best for Balancing the Chakras and Spiritual Healing. Because crystal has all the colour in the spectrum to make up clear light it will emit whatever colour is necessary to balance the chakras. You need to read the page on the amethyst pendulum for general instruction for pendulum use, remember to always say an affirmation and do a white light visualisation to protect yourself and others involved from any negativity. Hold the pendulum over the each chakra and watch its swing, small circles indicate a closed chakra while a large circle will indicate it is open. If the chakra is closed or the pendulum feels sluggish you can open them up with mental affirmations saying to yourself ‘let this chakra be open’ and repeat until a change is noticed in the swing of the pendulum. Using your intuition continue to use the pendulum until the circles are medium sized and feel in harmony. As with the healing stick always use indigo, violet, or orange to protect and calm after treatment. With experience you may need a more accurate reading with a point, we recommend using the fashion crystal pendant for this purpose. As you will have been wearing it then it will be tuned into your vibrations. This entry was posted in Beliefs and Practices and tagged affirmation, aura and chakras, harmony, healing, intuition, negativity, pendulum. Bookmark the permalink.